This is our signature programme and the most results-driven coaching any business owner can put to use. Our one-on-one business coaching system is so solidly proven that we guarantee results for our clients. One-on-one coaching accelerates results, makes a real difference to your lifestyle and adds value to your business. Not sure why you need an ActionCOACH? By having regular one-on-one coaching sessions an ActionCOACH will use their experience to help you develop attainable long-term goals and strategies for your business. Enlist on our programme and join hundreds of other business owners successfully increasing their profits. Designed for companies ready to commit to business growth. 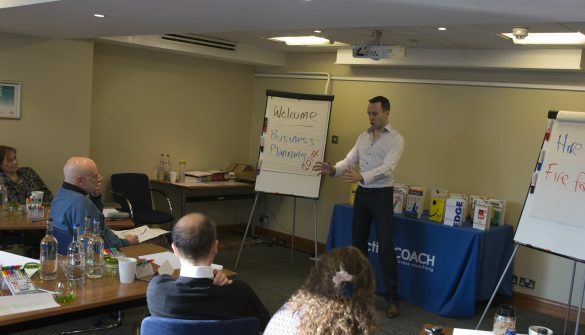 The coaching follows the ActionCOACH 6 steps framework which is proven to work for hundreds of thousands of companies. Contact us to find out more information on how to get involved. What is one-on-one coaching & how does it work? To ensure success, the one-on-one business coaching process starts with an alignment session to get absolute clarity on where the company is now and where you want it to be. The outcome of that drives the coaching programme. The first stage of one-on-one coaching process is normally around mastering time to enable the Owner/Directors to have time to work strategically on the business. The second stage is normally to review/set an outline of the business plan and set goals. The goals are explored and your coach will also look at personal goals to ensure the motivation and focus is rounded. One-on-one coaching sessions are weekly or fortnightly and because you’re probably spending the bulk of your time working ‘IN the business’, the focus for these sessions is working ‘ON the business’. Beyond that, it depends on the company and goals set at the alignment. Is this suitable for my business? This one-on-one business coaching programme is suitable for high quality businesses already experiencing steady growth, but with the goal to grow more rapidly. You’re probably working too many hours and your business would not survive without your constant attention. In other words, your business is not reaching its full potential. These programmes are only for those fully committed to change and willing to embrace new challenges. These are the mindsets of the business owners who’ve achieved the spectacular results and award wins we’re so proud of.